Background: Microbial infection and its resistance to clinically approved drugs create a huge threat to human health. Emerging reports have indicated the potential of statin drugs in the treatment of various types of microbial infections. However, it is still unclear, how much concentration of statin is effective against microbial infections. In literature, Minimum Inhibitory Concentration (MIC) values of statin drugs vary according to strain, species, and the type of statins. Thus, the main aim of the current study is to compare the MIC values of various types of statins against various types of micro-organisms. Methodology: The data related to statin and microbial infection has been extracted from Pub Med (from September 1987 to October 2017). A total of 662 studies have been published from 1987 -2017 regarding statin and microbial infections. After inclusion and exclusion criteria, finally, 28 studies have been selected for comparative analysis of MIC values. Results: All the statin drugs have shown a significant effect on various types of microbial infections. Among all the tested statin drugs, Simvastatin has lower MIC value in almost all types of microorganisms as compared to other statin drugs. However, on S. pneumoniae and aspergillus, Fluvastatin has the lowest MIC values as compared to Simvastatin. Atorvastatin was found to be the most potent against almost all strains of gram-negative bacteria. However, Rosuvastatin and Pravastatin have high MIC value against all types of microorganisms. Further, FICI value indicated the synergetic effect of Simvastatin with Amphotericin B, Itraconazole, and Fluconazole against various strains of Cryptococcus. Keywords: Microbial infections, drug-resistance, statin drugs, MIC values, antimicrobial activity, HMG-CoA reductase. Keywords:Microbial infections, drug-resistance, statin drugs, MIC values, antimicrobial activity, HMG-CoA reductase. Abstract:Background: Microbial infection and its resistance to clinically approved drugs create a huge threat to human health. 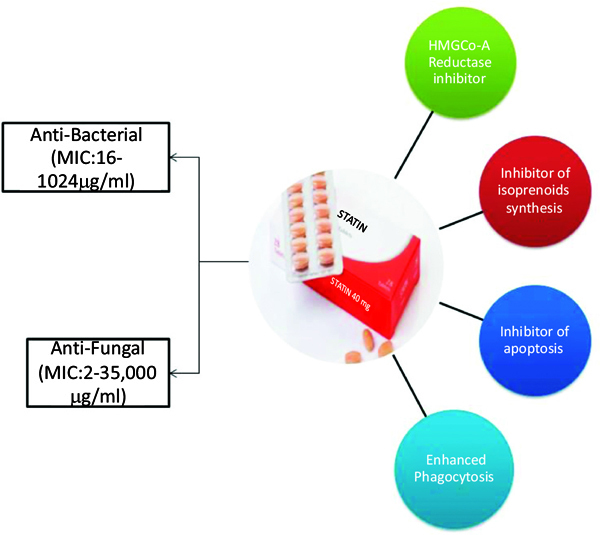 Emerging reports have indicated the potential of statin drugs in the treatment of various types of microbial infections. However, it is still unclear, how much concentration of statin is effective against microbial infections. In literature, Minimum Inhibitory Concentration (MIC) values of statin drugs vary according to strain, species, and the type of statins. Thus, the main aim of the current study is to compare the MIC values of various types of statins against various types of micro-organisms.